Notes from an ex-Fencing Jock. There are three sabers that hang over the mantle at our summer home here in Italy. They are my fathers and they are fencing swords. He was a fencer in college back when ink was used on the tip to determine a “touche”. He passed on the fencing bug to me and already a big fan of Tolkien and Dumas growing up I started taking lessons at Santelli’s in Manhattan. I loved fencing. I hated the fact that I had to do tons of tedious and repetitive exercises, but then again isn’t that true of all sports when you are a kid – you just want to play. I got pretty good and even earned a trip to the Junior Olympics to which my parents categorically said no. With no fencing team or club in college my Olympic hopes were dashed forever! 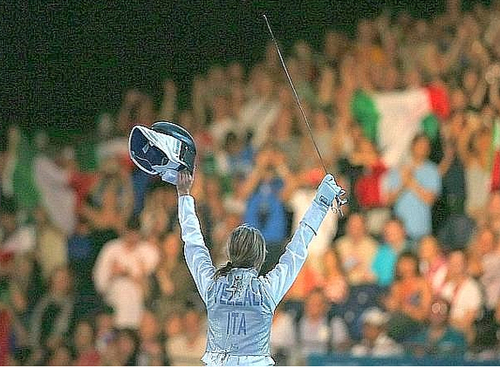 I do, though, get to live vicariously through today’s athletes and in particular one of the greatest fencers ever to fence in my opinion: Valentina Vezzali. Fencing is about speed, focus, cat-like reflexes, hand/eye coordination, footwork, balance and most of all timing. Even with modern technology it is hard to follow fencing with the naked eye and, at first glance, decide who landed a point or “touche” especially given the need to establish which fencer had the “right of way” when both are simultaneously on target. As so many individual sports, fencing gives you quite an adrenaline rush. Watching a “fuoriclasse” like Vezzali is a pleasure and an honor. Watching her dominate the sport for so long winning 6 gold medals in 5 Olympics (and medaling individually in all five), not to mention World (13 golds) and European (11 golds) Championships, is epic. I was pleased, therefore, to get a call from the New Amsterdam Fencing Academy (NAFA) recently inviting me (with a very funny reference to The Princess Bride) and my older son to a Daddy and Me lesson. They offer special classes for 2-4yo and their parents to teach them the very basics. I am really looking forward to holding a foil again after so long and hopefully having a fun day with my son (as always hoping for his full collaboration…). You can find out more about NAFA on their website http://nyfencing.com and I hope to report back about a fun experience. Who knows maybe one day I’ll see my son fence his way to the Olympics! Families of athletes get free tickets to all the events, right?